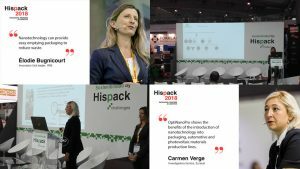 The project coordinator Dr. Elodie Bugnicourt from IRIS and the project partner Carmen Verge from EURECAT presented OptiNanoPro in the sustainability track of the Hispack tradefair on May 11. They reviewed the massive potentials of nanomaterials for generating among others transparent barrier materials, or materials allowing full emptying of the packaging to avoid wastes. The different contributions to sustainability were presented in terms of recyclability, resource optimisation, scrap reduction, enhanced shelf life, light weighting, etc. They also explained how the challenges linked to the processing of nano-enabled materials were tackled for example developing safe-by-design nanoparticles masterbatches and through in-line process monitoring. Furthermore, samples, as well as an ultrasound system for assisting nanoparticles dispersion in melt compounding, were shown. 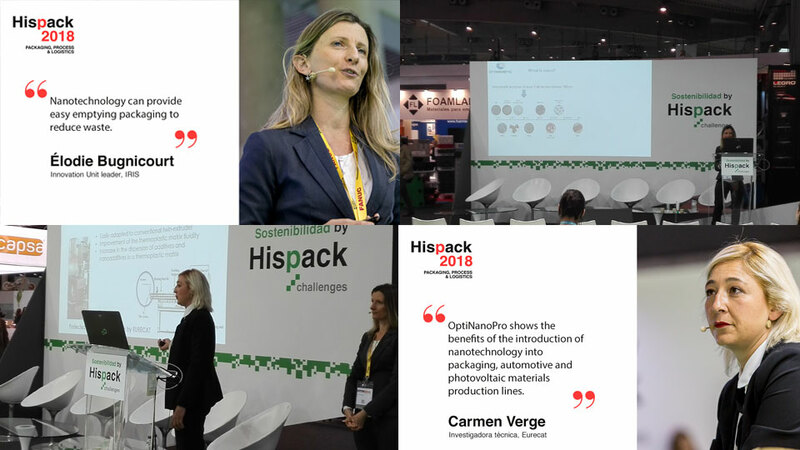 All in all, OptiNanoPro set a network of capabilities and pilot plants able to further deploy the promises of nanotechnology in the industry through further development and supply of products, solutions and sevrices along the value chains.